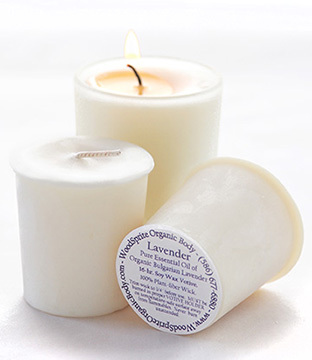 The simplicity of refreshing, relaxing, crisply floral Organic Lavender in our clean-burning Soy wax candles. This is the truest and highest quality Lavender essential oil we've found. Pure essential oil of *Organic Bulgarian Lavender. (*Certified Organic) 100% Plant-Fiber, Unbleached Wick. 16+Hour Burn. No dyes. No synthetic fragrances. Each of our beautiful hand-poured soy aromatherapy candles features pure essential oils and cotton-fiber wicks for the cleanest scent delivery in a soot-free, biodegradable vegetable wax. Some of our candles take on frosted, pastel hues of the essential oils used in them, much like the natural beauty and variety of bird's eggs.